Oh my goodness, i just got off the phone with my Aunt T. She was my mother’s favorite sister, (she had no problem letting her other siblings know it either); my godmother (she did her godmother duties when she became me and my sister’s guardian during the latter part of my mom illness); she is the most amazing woman I have the pleasure of knowing. I thank God for allowing me to be in her life and having her instill God’s greatness in me. It has been her prayers that’s been going up for me and my family. She prays for me even when I don’t have the sense to pray for myself. She is a prayer warrior in every sense. She’s up eary in the morning calling names out to the Lord, offering up prayers on the behalf of so many. She says it take her almost three hours to pray for everyone on her prayer list. From family and friend to friends of friend to complete strangers, people who just asks for prayer. I just got finish telling her that if no one else can get a prayer through, she can. Everybody in the family knows, if you have something going on, call her, she will pray for you and God will come see about you, for sure. I’m not saying that God wasn’t going to show up, but it’s like she got His direct number, like God always accept her calls, lol. She’s a wise woman, in her eighties. Her positivity is infectious. A lot of times, when people get up there in age, their outlook on life tends to spew a little negativity, some older people more than others. But Aunt T, even through her aches and pains or whatever is happening in her life, she is going to see the silver lining in it. She’s going to trust God, so much so, that you’ll be sitting on the outside looking in, wondering how she can be so positive when most people would’ve broke down on every level. I was adopted into my family. I truly believe it was in God’s plan to for my mom to adopt me because without her I would not know Him the way that I do. It’s because of my mom and my Aunt T that I know what God does for those who trust and obey him. Yes, we all have to experience God for ourselves, the relationship is personal, but sometimes it easier to be open to the possibility of the relationship if you witness someone else’s relationship with, and their faith, in God. It was seeing them go through and still trusting and believing in God and His promises, that gets me through my life struggles. I’m striving to fortifying my faith as strong as hers. So strong that I can look down the barrel of any situation and know, without any question or doubt, that it’s going to be alright, God’s got me because he promised He would. I’m so glad I call her this morning. 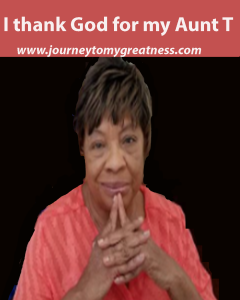 I didn’t know what I wanted to write about, but she has given me so much to think about and meditate on my spirit is joyous. Thank you, Jesus. Do you have someone in your life that just brighten your life. Share your love for them below.